Bizarre. Comical. Brazen. Adorable. Graceful. Beautiful. Startling. Unique. Describing the residents and habitat of the Galapagos Islands takes creativity and an exhaustive vocabulary. Nowhere else on Earth can you find such a collection of creatures in such an alien environment. Lava rock and scrubland give the archipelago a moonlike appearance, while its waters churn with three converging ocean currents. All the while, the animals remain just as fascinating today as they were over 180 years ago, when Charles Darwin first encountered them—a fateful moment that later inspired his groundbreaking work on evolution and natural selection. Modern visitors often feel as though not much has changed since then. In fact, nearly 95 percent of the biodiversity of this UNESCO World Heritage Site has been preserved as it was before human contact. Sometime around 5 to 9 million years ago, underwater mountains began forming seamounts near the present-day Galapagos Islands. The existing islands, made by piles of lava and shield volcanos rising from the ocean, began forming sometime between 700,000 and 500,000 years ago. Biologists believe that had those original islands formed any later, the islands would not be home today to such a wealth of endemic species. Over the next 300 years, other explorers, as well as pirates, whalers and seal hunters, passed by or stopped at the islands for firewood, food and water. Sailors would often take tortoises with them when they left because the remarkable creatures could stay alive for more than a year aboard a ship, providing the crews with fresh meat, even when far out to sea. It’s estimated that more than 100,000 were taken between 1811 and 1844. It wasn’t until 1832 that Ecuador laid claim to the archipelago, but even then, for nearly another century, there were few inhabitants beyond those in the penal colonies the country established. In 1835, Charles Darwin traveled to the Galapagos on his famous voyage aboard the HMS Beagle. His experiences and encounters with the geology, fauna and flora of the islands during that time contributed to his theories on natural selection, which he described in his 1859 landmark publication, On the Origin of Species. By 1934, some of the islands had been declared wildlife sanctuaries, and by 1959, nearly all of the archipelago had been declared a national park. At this point, tourism began in modest numbers. By the 1960s, humans began arriving in greater and greater numbers, and in 1978, UNESCO named the Galapagos a World Heritage Site. Concerns have arisen about the impact of so much human activity on the Galapagos’s fragile ecosystems, and in an attempt to protect the incomparable natural beauty and ecological significance of the islands, the Ecuadorian government has imposed restrictions on the number of people allowed on the islands each year. The culture of the Galapagos Islands has much in common with that of mainland Ecuador. With a population of just 25,000 people inhabiting four islands and the steady incoming flow of tourists, scientists and naturalists from around the world, however, the Galapagos is a unique blend of both local cultural diversity and cultural influence from Europe, the United States and mainland Ecuador. Many of the locals live and work in fishing villages and participate in the tourism industry, working at the hotels, restaurants, yachts and shops that have sprouted up as a result of this rise in tourism and UNESCO-protected natural diversity. Like in the rest of Ecuador, the currency used in the Galapagos is the US dollar, and cash is king. Visiting an ATM on the mainland before traveling to the Galapagos is recommended as ATMs are not guaranteed at all ports, and it’s not unusual for an ATM to be out of cash. Credit cards are accepted at some of the nicer hotels, shops and restaurants, but many of the smaller shops and restaurants might only accept cash. For most local tours of the islands, it’s customary to tip your guide and crew separately, with 50 percent of your tip going to the guide and the other 50 percent to be divided up among the crew. However, as tipping recommendations vary by ship, it’s best to consult the tipping guidelines when provided by your cruise. The Ecuadorian people tend to be laid back and understanding of cultural differences, but they’re also appreciative of common niceties, such as saying “good morning” (“buenos días”), “good afternoon” (“buenas tardes”) and “good evening” (“buenas noches”). Americans don’t need an adapter or converter. The power sockets on the Galapagos Islands are type A and B (two- and three-prong), and the standard voltage is 120V, which is the same as that used in the United States. Most public places on the inhabited Galapagos Islands do, in fact, have public restrooms. They might not contain things like running water and toilet paper, though, so it’s a good idea to carry your own pack of tissues and some hand sanitizer. It’s not safe to drink the tap water on the Galapagos Islands. Stick to bottled water, which can be found at many of the small shops and mini-markets on the inhabited islands. Its location on the equator means the Galapagos Islands experience the same warm climate year round, so there really isn’t a best time to visit. There is a rainy season that begins in December and ends in May, but the beauty of the landscape as it explodes into a lush and tropical scene, as well as the typically calmer seas, make this a great time to visit. The dry season, from June to November, transforms the landscape back into a barren tropical desert and always brings a steady southeast trade wind for some welcome relief from the equatorial heat. 25,000 people call the Galapagos home, living in small communities across just four of the islands. Due to its location along the equator, the Galapagos has an even 12 hours of daylight and 12 hours of night throughout the entire year. The Galapagos is the only spot in the northern hemisphere where you can see penguins in their natural habitat. Isabela Island: home to the Giant Tortoise Breeding Center, where giant tortoises are bred, raised and then released into the wild. San Cristóbal Island: Besides being the location of one of the Galapagos’s two airports, this island contains the Galapagos Interpretation Center. At this location, you can learn more about the history of the Galapagos and how its nature is being conserved and protected. Floreana Island: The first inhabited island of the Galapagos. You can find the famous Post Office Bay here, a rudimentary and unmanned post office reliant on those who pass by to hand-deliver the letters and postcards left in its barrels. Santa Cruz Island: A rolling landscape of misty highlands begging to be hiked and biked. 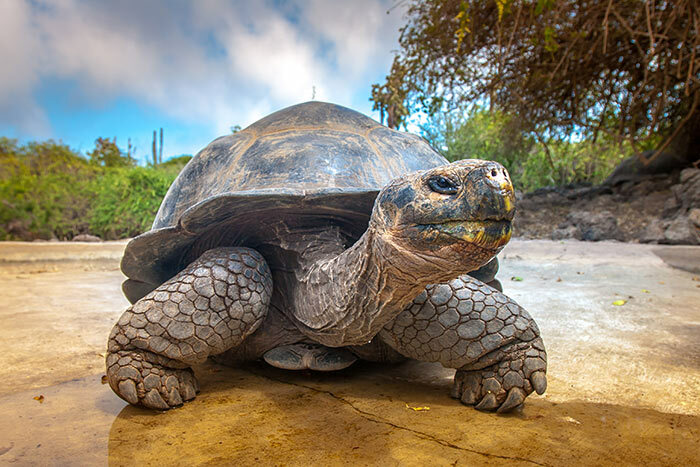 It’s also home to some of the Galapagos’s famed giant tortoises. 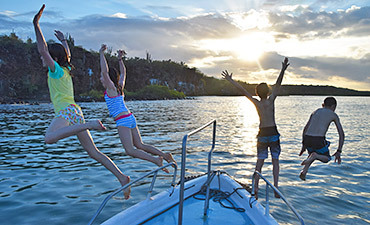 Baltra: The gateway to the Galapagos Islands. It’s a major point of entry for flights from Quito and Guayaquil, as well as a launching point for many multiday Galapagos cruises. It’s also the only island not part of Galapagos National Park. Bartolomé Island: Named after the lifelong friend of Charles Darwin, Sir Bartholomew James Sulivan, Bartolomé Island is most famous for Pinnacle Rock, a defining natural feature of not only the island but the entire Galapagos chain. It’s also a great vantage point for viewing the other islands. North Seymour Island: home to a large population of blue-footed boobies, swallow-tailed gulls and magnificent frigatebirds. Española Island: This is the only island in the Galapagos where you can see the waved albatross and its comical method of takeoff and landing. Española Island is also a great spot to go snorkeling and diving with the sea lions, tropical fish and turtles. Santa Fe Island: Known for its turquoise lagoons and resident sea lion population, Sante Fe Island is also a great spot to kayak and to snorkel among the sea turtles, reef sharks and colorful fish. The largest town in the Galapagos Islands, it contains plenty to see, to do and to eat, including snorkel outings at Las Grietas, natural history exhibits at the Charles Darwin Research Station and white-sand beaches at Tortuga Bay. Located on Floreana Island, this point has a scenic trail overlooking a saltwater lagoon where flamingos often gather. Situated on a white-sand beach on Floreana Island, you can find the same post office barrels that whalers have used since 1793. You can even partake in the long-standing tradition of collecting any postcards left there that you can personally hand-deliver to their recipients in your home country. Visas are not required for US citizens who are planning to stay in the Galapagos Islands for less than 90 days. Your passport must be valid for at least an additional six months from your date of entry. Flights into the Galapagos from Quito and Guayaquil land at either San Cristóbal Airport or General Villamil Airport (IBB) on Baltra. Baltra is the busier of the two airports, as it’s closer to Santa Cruz Island and Puerto Ayora, a popular launching point for exploring the Galapagos. The Galapagos Islands do have public buses, taxis and ferries. Walking and biking, however, are also viable options for moving about each island. 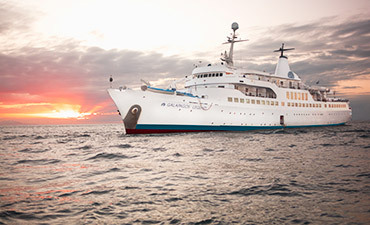 It’s possible to hire a private yacht, but a special permit is required, and a licensed Galapagos National Park service guide must be aboard at all times. Bolon de Verde: A fried dumpling of mashed green plantains, meat and cheese. It’s usually a breakfast or late-morning item. Encebollado: A thick, fish-based pickled onion soup filled with yucca and chili. It’s also a popular breakfast item (and a notorious hangover cure). Ceviche: One of the best seafood dishes you can order while visiting the Galapagos. It’s typically prepared with anything from fish, shrimp and squid to crab, octopus and lobster. Lobster: No Galapagos travel guide would be complete without mentioning the country’s famous red and green spiny lobsters. These are readily available on Calle de los Kioscos in Puerto Ayora. Fruit Juice: Made fresh with exotic fruits, such as babaco, jocote, guanabana (soursop), guayaba (guava) and naranjilla. All these are imported from the mainland. Food in the Galapagos: What to Know and to Eat—Full Article Coming Soon! When in the Galapagos, the safety risks have far less to do with crime and theft and more to do with the natural environment. Obey all rules when it comes to interacting with the wildlife and environment, both in the water and on land. Stay hydrated, and wear plenty of sunscreen at all times. It’s important to remember there are limited medical facilities in the Galapagos, and any serious medical care will require an evacuation to the mainland. It’s a good idea, therefore, to make sure your travel insurance covers medical evacuations. Established in 1979, Backroads is a pioneer in active, immersive and off-the-beaten-path travel. 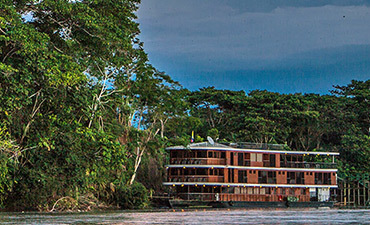 Now operating adventure tours in over 50 countries, our passion for discovery and our desire to experience the world in original ways continue to inspire our pursuit of new adventures. 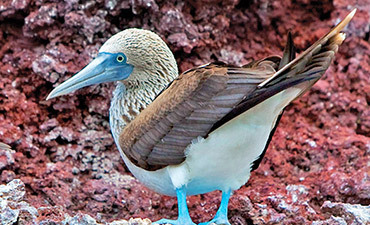 We hope this guide will be enlightening to you as you plan your next great Galapagos adventure!